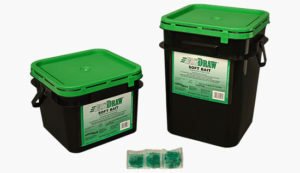 Fast Draw® Soft Bait is a revolutionary concept in rodenticide technology from Liphatech. It contains the active ingredient Difethialone, food-grade grains and oils, and has a unique no wax formula. FastDraw® pouches combine the bait integrity of mini-blocks with the money-saving, targeted dosing, of place packs. It is effective even in areas of infestation where competing food sources exist. Why wait for rodents to accept OTHER Baits? Draw a following of rodents with FastDraw! Powerful Attraction: unique no wax formula, for maximum attraction to get infestations under control. Convenient and Versatile: offers targeted dosing, with a 10-gram (0.35 oz.) easy-to-secure bait pouch, for challenging placements. Outstanding Results: contains the single-feed, active ingredient difethialone formulated at 25PPM for superior palatability.